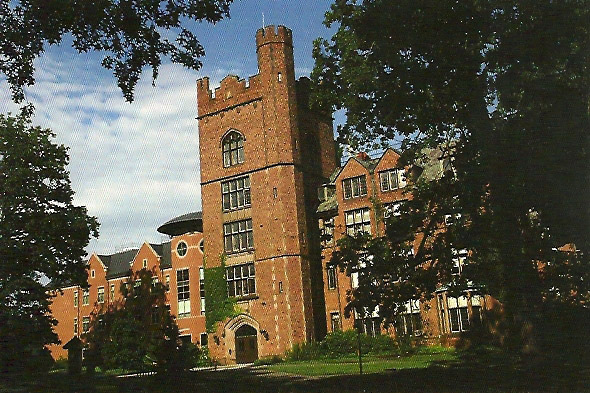 Built in 1924 on the former site of Williston Hall, which burned down in 1917, this building was named for Cornelia Clapp, a member of the class of 1871 and a professor emerita of zoology. It houses the biological sciences. back Divided back, stamp box, unused. 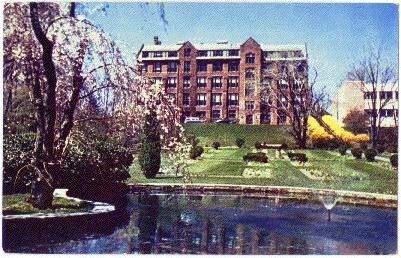 "1904 Garden and Clapp Science Building Mount Holyoke College South Hadley, Mass." 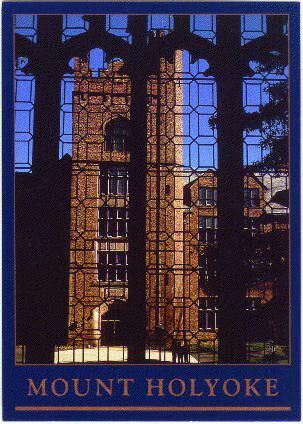 Distributed by Mount Holyoke College Bookstore. Natural Color by Mike Roberts, Berkeley 2, Calif. SC6293 - Photography by Raymond D'Addario. front "Clapp Laboratory, Mount Holyoke College"
back Divided back, postally unused but inscribed, "Thank you much for the beautiful souvenir from Florence. 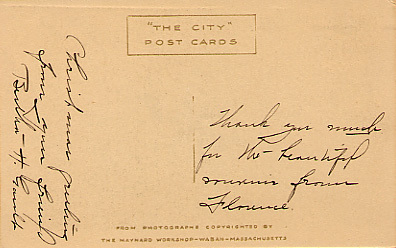 Christmas greeting from your friend Bertha H. Gault" Published by "The City" Post Cards. 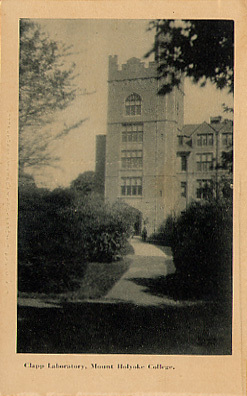 From photographs copyrighted by The Maynard Workshop, Waban, Massachusetts. 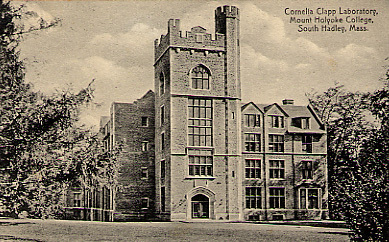 front "Cornelia Clapp Laboratory Mount Holyoke College South Hadley, Mass." back Divided back, postmarked Apr 28, 1953 5pm in South Hadley. Published by Robert A. Glesmann, South Hadley, Mass. Also marked by The Albertype Co., Brooklyn, N. Y. 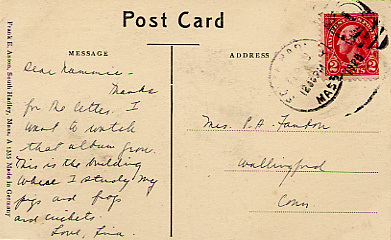 "Dear Nellie, - Received your card & you have probably received my letter by this time. The pattern was not in the package. I haven't finished the dress yet. I hope to get at it today. I hope that you find the pattern o.k. Love, Jean." back Divided back, unused. Published by Robert A. Glesmann, South Hadley, Mass. 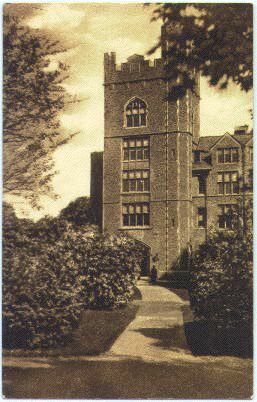 Also marked by The Albertype Co., Brooklyn, N. Y.
front "Cornelia Clapp Laboratory, Mount Holyoke College, South Hadley, Mass." back Divided back, stamp box, postmarked 1928 in South Hadley. Published by Frank E. Anton, South Hadley, Mass. #A1335 Made in Germany. "Dear Mammie - Thanks for the letter. I want to watch that album ... This is the building where I study my pigs and frogs and crickets. Love, Lina." 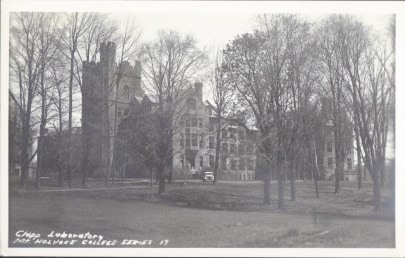 front "Cornelia Clapp Laboratory, Mount Holyoke College" to the left, and "South Hadley, Mass."  to the right. 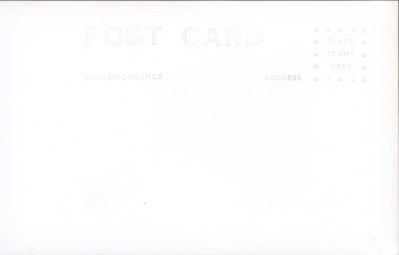 back Divided back, postmarked July 13, 12:30pm in an indecipherable year. Published by Robert A. Glesmann, South Hadley, Mass. Also marked by The Albertype Co., Brooklyn, N. Y. 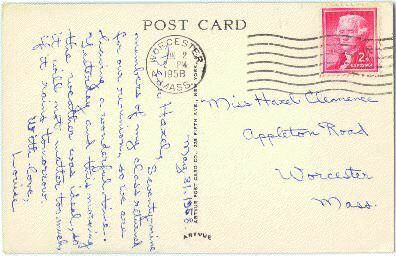 "Love from Ellen Hannafin"
front "Clapp Laboratory, Mount Holyoke College, South Hadley, Massachusetts"
back Divided back, postmarked Jun 2, 1958 2pm in Worcester, Mass. 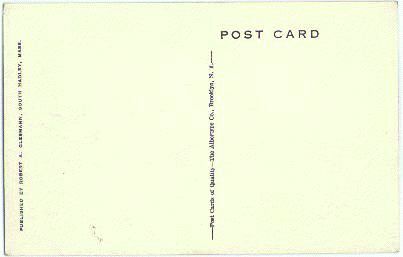 Published by Artvue Post Card Co., 225 Fifth Ave., New York, N. Y. "May 31, 1958 Dear Hazel, Seventy-nine members of my class returned for our re-union, so we are having a wonderful time. Yesterday and this morning the weather was ideal, so it will not matter too much, if it rains tomorrow. With love, Louise"
back Divided back, postally unused. Published by Robert A. Glesmann, South Hadley, Mass. Also marked by The Albertype Co., Brooklyn, N. Y. Inscription: "This is one of the buildings in the science groups. This is for biological sciences - They want to build one for chemistry sometime -"
back Divided back, unused. "Cornelia Clapp Laboratory Mount Holyoke College South Hadley, Massachusetts" The Albertype Co., Brooklyn, N. Y.
front "Clapp Laboratory, Mount Holyoke College, South Hadley, Massachusetts" Identical to this one, but this one was inscribed too, and I couldn't resist. back Divided back, postmarked Aug 9, 1957 4pm in North Amherst, Mass. 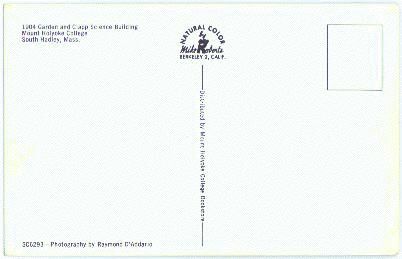 Published by Artvue Post Card Co., 225 Fifth Ave., New York, N. Y. "Friday Dear Mother: Just took Cousin Abby for a ride. She comes to Amherst next week for 2 weeks. Porter was at the house last evening so we heard about his trip to Switzerland. Had lunch with Polly Collins and Mrs. Cramer. Will write this weekend. Love, E."
front A lovely black etching on creamy cotton paper. "The Cornelia Clapp Laboratory anno Domini 1923" Inscription: "A specimen of the Christmas cards sold for the Building Fund." The Building Fund for Clapp, I imagine. back "Wallingford Dec. 22, 1924. Dear Catharine, I know you will soon be home, but if you are anything like me, the last few days are the hardest to wait.. I came Friday afternoon. Friday night I went up town shopping with Mama and tonight we are going again. Your bundle came and I was allowed to peak [sic] some. I got an awfully cute little basket for Aunt Bel and Mamma got stockings. Mamma is almost through tying greens. We have two very vigorous kitty-cats, the color and almost the size of Tuffy. Wednesday night at college we had our Christmas party. Lots of fun. Did you know Gladys Thomas alias "Tommie"? She came back visiting the other day. 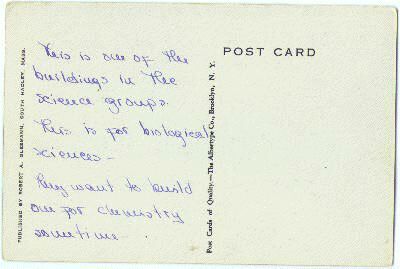 Love, Lina"
front "Cornelia Clapp Laboratory, Mount Holyoke College South Hadley, Mass." back Divided back, postmarked Oct 31, 1929 10am in South Hadley. Transit mark Nov 1, 1929 6pm in Catskill, NY. Published by A. S. Kinney, South Hadley, mass. and The Albertype Co., Brooklyn, NY. "This is a very fine science building with well lighted rooms. Speaking of brightness reminds me of the niece, Marcella. She has quite a vocabulary now and talks very plainly. I don't know whether its [sic] safe to tell you on a post card what she calls me. Well, she leaves off the last syllable of my name, the little rascal. Helen." front Untitled view of Clapp. back Divided back, unused. 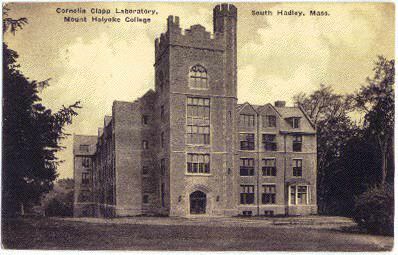 "Cornelia Clapp Laboratory Mount Holyoke College South Hadley, Mass." Published by Mount Holyoke College Bookstore, South Hadley, Mass. and The Albertype Co., Brooklyn, NY. 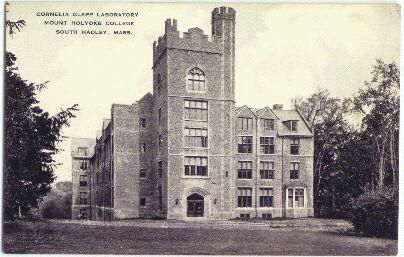 front "Clapp Laboratory, Mount Holyoke College." back Divided back, unused. "The City" Post Cards. From photographs copyrighted by The Maynard Workshop, Waban, Mass. 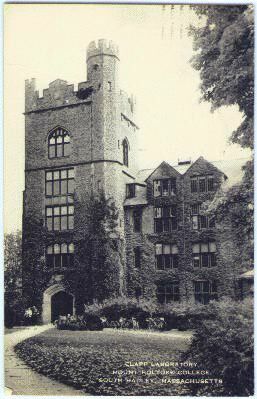 front Untitled real photo of the library, Clapp, and the chapel from College Street. back Undivided back, postmarked Sep 19, 1934 5:30pm in South Hadley. "Dear Mother, Would you send the white [pecay?] piping in the collar drawer? I want it for my gown and soon. Miriam & Mary are back. Bobby too. Now I'm going to sell shoes. Lovingly, K."
front "Clapp Laboratory Mt. 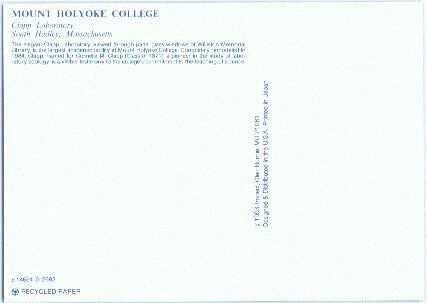 Holyoke College Series 19"
back Undivided back, stamp box, unused. AZO. 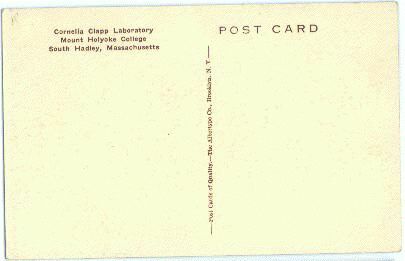 front "Clapp Laboratory, Mount Holyoke College, South Hadley, Massachusetts" I also own the negative that was used to create this card. back Divided back, unused. Artvue Post Card Co., 225 Fifth Ave., New York, NY. 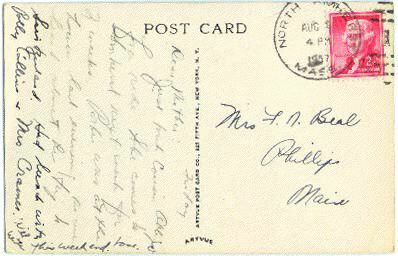 back Divided back, postmarked May 21, 1928 4:30pm in Meriden CT. Published by Robert A. Glesmann, South Hadley, Mass. Also marked by The Albertype Co., Brooklyn, N. Y. "7:30 p.m. Sun. Evening I am back safe in North Haven and we have had such a wonderful time! Mary took trolley here. I'll write soon. Everything was a great success except the weather. Thanks lots. Ellena" Sent to Ruby Sanborn. 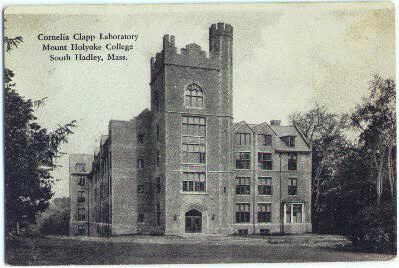 front "Cornelia Clapp Laboratory, Mount Holyoke College South Hadley, Mass." Transit mark May 29, 1934 in Izmir, Turkey. back Divided back, postmarked in South Hadley. Published by The Albertype Co., Brooklyn, N. Y. Translation courtesy of Enis Turcan: "4 May, Friday 1934 My dear sister, Last week I sent you a registered letter. This was for the permission of holidays. This week on Sunday I had a visit from Columbia University from two Turkish boys. They drove me with their car to Zekiye's college. We will meet each other in New York again in the summer. I have gotten 12 credits from the professor for German and if I could pass the examination in the coming semester I will earn apprx. 1 year. I will work very hard to reach this big opportunity. I am very well and I will write a letter to you the next week. 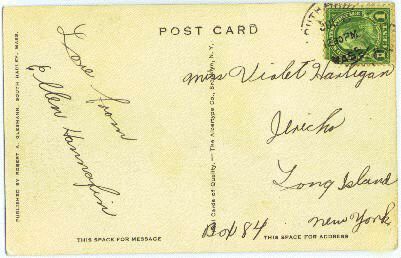 Leman Avni"
back Divided back, postmarked May 10, 1937 10pm in Yonkers NY. Stamp missing. Published by Robert A. Glesmann, South Hadley, Mass. Also marked by The Albertype Co., Brooklyn, N. Y. Inscription: "Dear Louise - I have just returned from S. Hadley. Marion and I went up with Ella in her car. I missed you, and wished you were with us. Anna Woods, Sophie Walton and Mary Kimball were the other members of '79. It was a very wonderful occasion. The exercises were most interesting, and the campus as always was lovely. With love, Yours Kittie Porter Hull." front Untitled view of Clapp Laboratory.